At Walt Disney World, I want the girls to wear certain outfits on certain days. You know, the red dresses for breakfast with Pooh, the matching t-shirts for dinner with Mickey and so on. I also like to lay out all of our clothes the night before to make mornings a little smoother. We tend to visit WDW with my parents so I have available helpers when it's time to get us all ready to go. Packing each day's clothes into a gallon-size ziploc bag helps with all of the above. Outfits, underwear and socks for both girls can fit into one bag. I label them with the day of the week. When I am packing our suitcases, it's simple to see that I have what I want for each day. On vacation, it's simple to get the next day's garb ready to go and if Granny wants to help dress the girls, it's simple to give her what she needs. I'm a fan of simple. The bags also stack nicely in the suitcase with plenty of extra space for pajamas, swimsuits, and a few extras. The empty bags go back in the suitcase for another trip. The photo above is from our WDW trip in May 2013. What helps you get your kids packed up for vacation? Please also check out my post on packing your Disney diaper bag. Great advice! 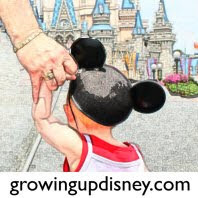 We're going to Disney in a few months for the first time so I love these helpful tips! I love this idea. Another idea for the empty bag is you can put the worn/dirty/germy outfit back into the bag to keep it separate from the clean clothes. Have you seen photos like this?